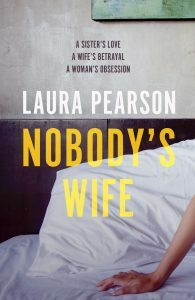 Agora Books is beyond thrilled to finally announce that Nobody’s Wife, the second novel from Laura Pearson, is out now! Nobody’s Wife is the story of a sister’s love, a wife’s betrayal and a woman’s obsession. Nobody’s Wife is available to buy HERE. To keep up with our new releases in 2019, sign up to our Agora Books Newsletter or follow us on Twitter @AgoraBooksLDN, and be sure to follow Laura on Twitter, subscribe to her Book Club, and check out her website laurapearsonauthor.com.